If you have followed my blog for some time, you may already know that I am not really a big fan of lip products. If I have ever written a post about all of the different products that I wear on a daily basis, I tent to just glaze over lip products because I don’t really tend to wear them all that much. I think it is because over the years, my lips have been that soar because they are prone to chapping, so I just don’t want to draw attention to them by applying lipstick, lip liner or glass to them. 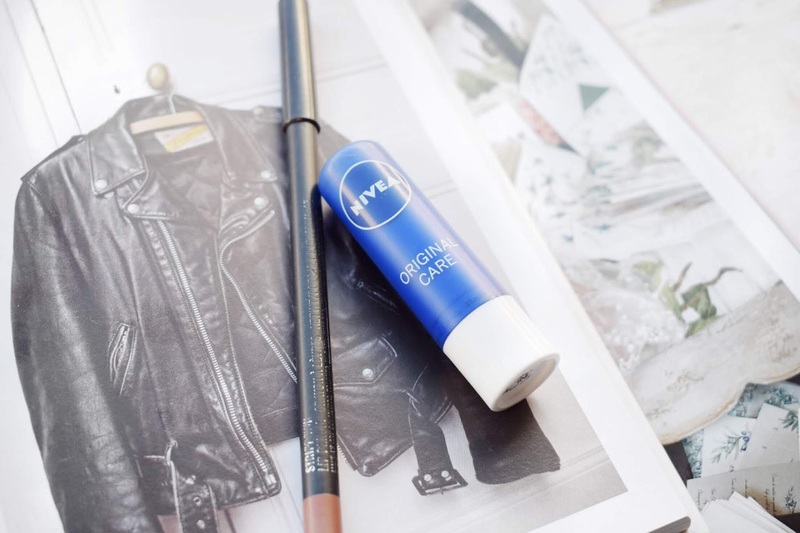 But, over the past couple of months, I have been forcing myself to wear more lip products and that is why I am writing this post for you today. It wasn’t until this past Christmas that I really started to fall in love with actually wearing lip products. We were going to a Christmas party and I was going my makeup with a girl from work and she forced me to try on a lipstick that she had bought, and I loved how it looked. I guess looking back, it is a little odd that I would do a full glam makeup look and then avoid my lips all together, but I guess that is just what I felt more comfortable with at the time. After actually wearing lip products for a couple months now, I now feel odd when I don’t define my lips. So, I thought that I would share with you guys my favourite and very simple lip combination that I am in love with at the moment. To start with, I go in with the classic MAC Stripdown. Over the year I have tried our almost every single MAC liner, except for this one. It wasn’t until I saw somebody using this on YouTube and I saw the shade of it that I realised that I was going to have to get my hands on it and try it out. I think in the end I bought this from ASOS and I had a voucher and a discount code, which made this even cheaper. From the moment that I got this and started applying it, I fell in love because it really is a ‘your lips but better’ kind of shade and it is perfect for helping to define my lips. When, once my lips have been very lightly defined with the MAC Stripdown, I go in with my trusty old Nivea Lip Balm. I have been using this stuff for years now and it is the only thing that really helps my lips to stay nice, supple and soft. As I apply a generous layer of this to my lips it blends into the lip liner and helps to defuse it and make it look nice and natural. With this combination, it helps to plump up my lips, keep them looking nice and soft, yet at the same time they have shape and structure to them because of the lovely shade of the lip liner. I know that this is a super easy lip combination at the side of what some people do contouring their lips and the like in this day and age, but I feel that this really works for me. It is such a stunning combination and I think that it is the most perfect shade for me and my colouring. Make sure to leave me a comment down below and let me know what you go to lip combination is for an everyday kind of basis! Love me some lip balms, haven't tried this one from Nivea yet. It is just a great basic item! It is a great staple item! It is just a great classic item! i LOVE that you can now buy MAC on asos (but my bank account definitely doesn't!). i bought strip down a few months ago and have pretty much been wearing it religiously since, such a lovely, subtle colour! It is so helpful and I get student discount too so the 10% off is a massive help! It is absolutely amazing for the money! Nivea lip balms are such an OG, they're hydrating and not over priced. They are so affordable and amazing! MAC Stripdown is such a beautiful shade! love this lip combo! so simple and pretty! I absolutely adore it, amazing quality! I can't leave without lip balm. I have tried so many from the drugstore but have yet tried this one from Nivea. It is essential for me and my dry lips! I am obsessed with the NIVEA lipstick myself. I feel like it's the only one that truly works for my lips. It is absolutely amazing quality! I'm the same with lip products, they're just never something I usually reach for. This year I'm trying to do better, especially on the dry lip front, and incorporate more into my daily routine. It is just amazing quality and for the price you cannot go wrong! I love the MAC lip liners and lipsticks! I love Spice but have never tried Stripdown so need to add that to my wishlist! Spice will always be another one of my favourites from MAC! Lip balms are a must, especially for winter. I use them all the time! I love them all year round! You have to get your hands on it and try it out soon! It is just a staple product in my collection!